Using our online payment processing provides your customers the convenience of making payments 24/7. The solution’s versatility allows for the processing of debit, credit and electronic check payments on either recurring or one-time frequencies. Plus, you’re never at risk of fraud because our secure database never stores any credit card information on your system. that work for any business need. Our payment gateway is also equipped with a range of features to serve e-commerce payment processing needs. Whether you need electronic receipt capabilities, shopping cart integration or fraud detection, we’ll tailor an e-commerce solution to have your business competing with the e-tail giants. In today’s world, being able to pay online with card or eCheck is an expectation, not a perk. Our team can equip you to meet this growing expectation, while charging only a nominal convenience fee to your customers. 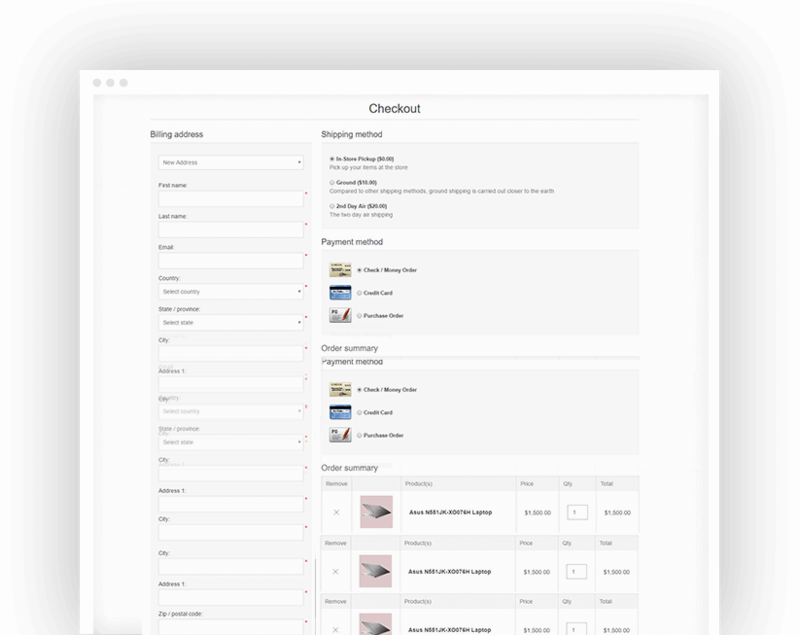 Our experienced team can custom-design a hosted order page that’s seamlessly branded to your company, making it easy for customers to make online purchases by moving from your site to our order page. Eliminates your costs associated with safeguarding this information. Today, it is more critical than ever that businesses have access to quality, effective merchant products and services to meet their business goals. Merchants simply cannot compete without efficient payment processing hardware and software, inventory management solutions and special services like customer loyalty programs. Why Choose Unity FI Solutions? Unity FI Solutions does more than just process card payments – we’ll also help you build and expand your business though a full suite of cost-effective merchant solutions. Unity FI Solutions can assist you by tailoring the latest payment products and services available to suit your specific business needs. We will help your business take the maximum advantage of opportunities in the marketplace. Unity FI Solutions meets a variety of needs for both long-established and growing businesses. Unity FI Solutions offers competitive rates and fees to get you up and running quickly and efficiently, and our services are ideal for any retail establishment or other business in need of secure ecommerce solutions. Choosing a POS system can be a daunting task, but Unity FI provides a solution that can easily be configured to meet your business’s specific needs. A gift card program offers businesses the opportunity to increase consumer engagement, new business and sales. Our gift card processing program is simple and safe, requires minimal setup and has an easy-to-navigate interface. It can also be integrated with other Unity FI Solutions payments solutions. For businesses with a brick and mortar presence, Unity FI Solutions provides wireless payment processing capabilities. These terminals safely transmit payment information at the point of sale in an easy, efficient way. The more ways customers can pay, the more opportunity there is for transactions to occur. Unity FI Solutions can set up payment processing for EBT transactions to add to the business’s existing credit, debit and gift card processing. Collecting detailed data on customers can provide a business with important insights that lead to increased sales and revenue. Unity FI Solutions provides this type of online reporting to businesses using our payment processing programs. Customer retention is key to running a good business. Implementing a loyalty program that rewards customers for purchases and encourages them to return and tell others about their experience. The Unity FI Solutions platform allows businesses to customize an online portal and manage points, rewards and other incentive programs. Unity FI Solutions provides an easy-to-use automated billing system for businesses that process subscriptions, membership fees or any other type of recurring transactions. This solution can decrease the man hours needed to manually enter billing information and essentially lower costs. A strong web presence is important for businesses that operate both online and offline. Our services can seamlessly blend into your existing website.